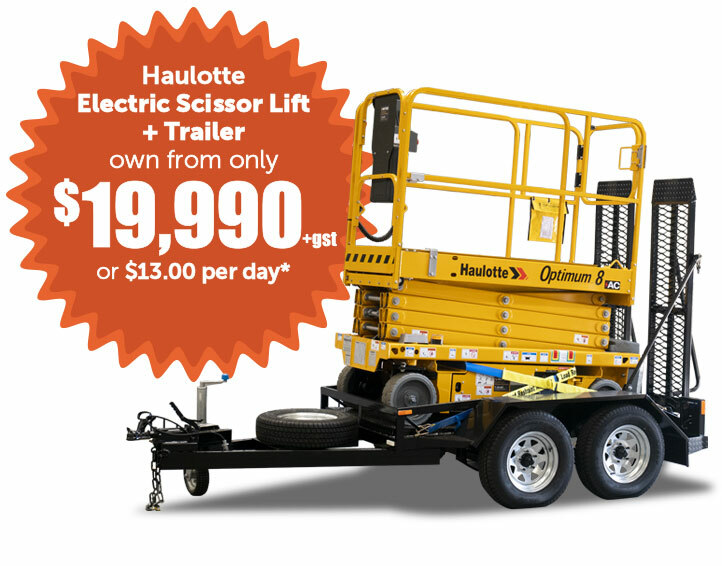 The Haulotte Optimum 8 scissor lift AC and trailer is the perfect tradie combo that delivers a compact, versatile and smart scissor lift that’s ready for any job site. Own now for $19,990+gst or from $13.00* per day. The scissor lifts compact size makes it highly versatile for both indoor and outdoor applications. Its narrow 76cm width allows it to easily access the most difficult areas including doorways. It also has one of the best turning radiuses in its class with an extremely tight radius of 1.5 metres. The optimum 8 AC scissor lift is driveable at full height (7.77m) and includes an extendable platform. It offers precision handling and movements with its removable control box. It is also the only scissor lift to include a heavy-duty counterweight. This acts as both an access point as well as a shock absorber to prevent damage from knocks. The Optimum scissor lift includes Haulotte’s Activ’Screen embedded diagnostic system. This easy to use system provides operators with key information such as alarms, battery charge and maintenance alerts. It also allows technicians to easily diagnose malfunctions for quick troubleshooting and easy maintenance without tools. The Optimum 8 AC scissor lift is one of the most versatile scissor lifts on the market. Ideal for both indoor and outdoor use, it provides a 7.77 metre working height with 230kg lift capacity. The highly manoeuvrable scissor lift offers the best lifting and driving experience with a forward speed of 5 km/h. It smooth proportional movements thanks to its AC motors also makes it highly flexible with both elevation and driving. With the scissor lift and trailer package, it ensures transporting the scissor lift is both quick and easy. Businesses can increase productivity by having a versatile scissor lift always available . More importantly businesses can also reduce costs by eliminating the need for hiring and transportation. This scissor lift is perfect for a range of industries including electrical, plumbing, painting, air-conditioning, roller doors, lighting, signage, retail, entertainment facilities and even schools. For more information download the Specifications brochure. *All prices listed above are Exclusive of GST and do not include delivery. Finance prices are based on a 60 month finance term. Nil balloon. $300 establishment fee. This is not a finance approval. Finance provided by Finance Exchange Australia Pty Ltd. Credit License No. 364764. Finance prices are subject to exchange and interest rate fluctuations. Photo for illustration purposes only. Promotion includes painted trailers only. Galvanised trailers are extra. Trailer type may vary from state to state, please speak to local United rep for full information. Pricing excludes local trailer licensing and registration. Prices valid until 21st December 2018. Our company recently decided to purchase our own scissor lift and trailer, after discussions within our business and accountants, into the amount we were spending each financial year on hire and delivery expenses to get a scissor lift to our various sites. We contacted United to discuss the purchase of a Haulotte Optimum 8 AC scissor lift (our preferred scissor lift) and their finance options available. Their finance team was easy to deal with, a very streamlined straightforward process with common sense basic requirements to provide to finance the purchase (I had been in the finance industry for 30 years prior to this role). We have been very pleased with the level of professionalism and constant updates from United in the entire process of our purchase. We needed to have the trailer modified with a longer draw bar to accommodate towing within all our vehicle fleet, and this was not an issue for United, as it was with other companies we contacted. Would highly recommend United to any size business for any scissor lift or access solution, based on price, financing and customer service. As with any business you need good partners to find cost-effective solutions to allow your company to run more efficiently.